MapleStory took up much of my time so many years ago, being a such a surprisingly addicting game that happened to be free-to-play. So it definitely takes me back to see MapleStory 2 having such a lively booth at Pax West 2018. After many years of MapleStory being a strong headliner for Nexon, MapleStory 2 is finally about to hit the states. Advancing past the 2D platformer model that added so much to the game’s visual appeal, MapleStory 2 takes its next steps in a brand-new 3D environment. Let’s go over some of the highlights that MapleStory 2 has in store for its release on October 10, 2018. The biggest and most obvious change in MapleStory 2 comes in the form of its 3D block world. It still behaves as an open world platformer, full of randomly-spawning enemies, where you explore and fight throughout various maps. You play as one of eight available classes: Assassin, Berserker, Heavy Gunner, Knight, Priest, Archer, Thief, and Wizard. Like the first MapleStory, each class has their own set of cool-down oriented skills that are suited for that class’ purpose and style. Outside of gameplay revolving around battling and exploring, MapleStory 2’s heavy focus is in customizability. MapleStory always had its fair share of customizability in terms of appearance and skill point allocation. MapleStory 2 takes it to the next level, allowing you to create and design your very own clothing, gear, and home appearances. 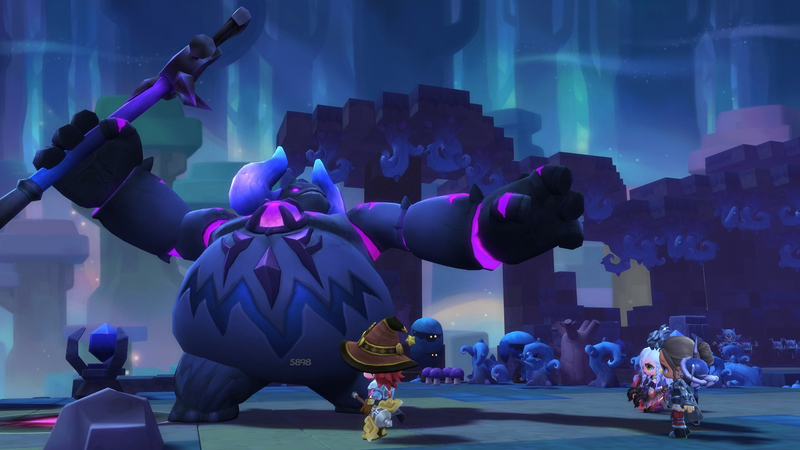 MapleStory 2’s Design Lab not only drives all of this customization, but it also aspires to give gamers the ability to create their very own dungeon runs. If roaming a brand-new 3D world is not enough of a playground for you, MapleStory 2 is working to let you create your own in the future. At Pax West 2018, show attendees got the chance to try out MapleStory 2’s combat gameplay, minigames, and new customization options. The character customization appears more detailed than ever before, allowing you to move hair and facial features all around your character’s head. You can even take garment types out of the game and into your preferred image editor to create your very own garment designs. Outside of that, gameplay pace felt true and close to the original, despite the game’s new 3D overhaul. The camera stays at one angle throughout the majority of gameplay while giving you zoom options. Camera rotation options are available when you are browsing around and designing your very own home. † Non-watermarked game screenshots provided by Nexon PR.